There are a few advanced settings you can manipulate. Each time you create and save a medley, a PictureMedley project file (with an XML file extension) is created automatically for you, along with a HTM file containing an IMAGEMAP of the medley. You can quickly return to the same settings using the Load Project File option in the File menu. settings for the medley, which you can edit if needed. The XML in the project file is compatible with Excel's data analysis features, so if you are so inclined, you can import the data from the project file into Excel and analyze the generated medley to determine interesting things like how tiles are used, how many times they are repeated (if at all), where they tend to land, etc. Print Size (width and height, in inches), providing finer control over the smart options on the main screen. Tiles on longest side provides finer control than the main options screen allows. Tile Overlap. This is the percentage by which the tile will be enlarged or reduced. This percentage can be negative or positive! The amount of separation or overlap is proportional to the percentage selected. Page Color - PictureMedley includes special handling for transparency in target images. You can separately control how transparent regions in your target image are handled during medley generation and the final save operation. Comparison - Choose "Transparent" to ignore transparent areas of the target image when selecting tiles to place. Tiles which partially cover transparent areas will only be compared for the region that covers a non-transparent area of the target image. Output - When the final medley is saved to disk, you can choose a color will fill the page, or choose Transparent if you will decide later (or if you intend to bring the output into another program like Photoshop for further re-composition). Tile Color - Tile images can also be transparent, and this list allows you to choose how to handle transparent areas of individual tiles. Choose Transparent to keep them transparent; during tile comparison transparent areas will be ignored, and during rendering the images will overlay transparently. Choose a color (or "random") and PictureMedley will use that color for both comparison and rendering. The software is optimized to use each image only once. If you try to add a folder or image to the Source Images list multiple times, the folder or file will be ignored after the first time. PictureMedley is also smart enough to realize when two files are copies of the same image, and the duplicate image will be tossed out. When the software determines that you have not specified enough tile images to uniquely populate the medley, the software will confirm whether tiles should be repeated. Some artistic effects can be achieved by purposely allowing tiles to be reused as needed. 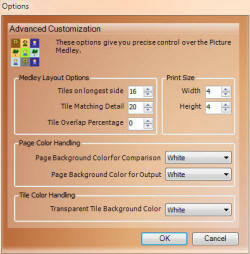 To allow this, deselect the "Improve medley quality by using tile images only once" option in the Customize menu. The software is not optimized to distribute duplicated tiles far from one another, so the resulting image will have noticeable repeats in the tile sequence (meaning that identical tiles may sit next to each other). By selecting the "Tile Portions" or "Tile Nudges" options under "Tile Tweaks", you can increase the likelihood that repeated tiles will be derived from different crops and reduce the visibility of such artifacts. The software is designed to automatically check through the internet to find out if a newer version of PictureMedley is available. It can also check for beta versions.